Norman Lodge - Has Peninsula developer reneged on public pledge? 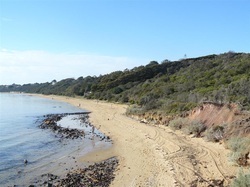 The Mornington Peninsula Shire Council again considered the controversial Heritage Victoria listed Norman Lodge property in late November 2010. The 50 hectare Nepean Highway site is at the north end of the green wedge between Mount Eliza and Mornington. Encompassing a number of titles, the property extends from the highway to the beach. In December 2007 the Victorian and Civil Administrative Appeals Tribunal (VCAT) directed that a permit be conditionally issued to a company controled by retirement village operator and developer Charles Jacobsen. The permit allowed for the realignment of the property’s internal boundaries to create two “new” building allotments. The original proposal was for three. The appelant was the Mount Eliza Aaction group who coalesced over this issue in 2006. The permit conditions direct the transfer of 5 hectares of coastal vegetation contigious with the beach to the Council and its addition to the coastal reserve. Other permit conditions dealt with the provision of internal access to the “new” reserve, a $1m bond on the historic home’s restoration and its annual opening to the public for the purpose of fund-raising. Shire CEO Michael (the Coach) Kennedy OAM recommended to his councillors that the land should be fenced to preclude public access; that the Council pay half the costs of a proposed 1.8 metre high fence; that it accept $221k as being half the cost of implementing the reserves Vegetation Management Plan and that the council pays half the cost of construction and maintaitenance of the internal vehicle access track to the coastal reserves for a period of 10 years. MEAG are claiming a foul and that an unjust free kick appears to be in the offing. They drew Mayday's attention to a 4 page A4 glossy leaflet personally signed and distributed to about 6500 Mount Eliza homes by the developer prior to the VCAT hearing in 2007. It says “There will be a conservation plan prepared by an expert together with a management arrangement funded by each of the land owners to ensure the long term maintenance of the reserve – all at no expense to the Council”. Neither the Vegetation Management plan, costs associated the fence or the construction and maintenance of the internal access road are recorded in the report to Councillors. However a confidential report from the developer was. Councillors lead by Mt. Eliza ward’s Cr.Leigh Eustace and Mornington ward’s Cr. Bev Columb declined to endorse the CEO’s proposition and called for more information. There is no report of consultation with the overarching foreshore manager DSE who initiated the initial land contribution. Mayday awaits the mud hitting the proverbial council fan – were this proposal to proceed, to the best of Mayday’s knowledge, it would be the only coastal reserve on the foreshore any where that’s fenced to the public but open to freehold land on its other frontage. Developers Flier "There will be a conservation plan prepared by an expert together with a management arrangement funded by each of the land owners to ensure the long term maintenance of the reserve – all at no expense to the Council”.